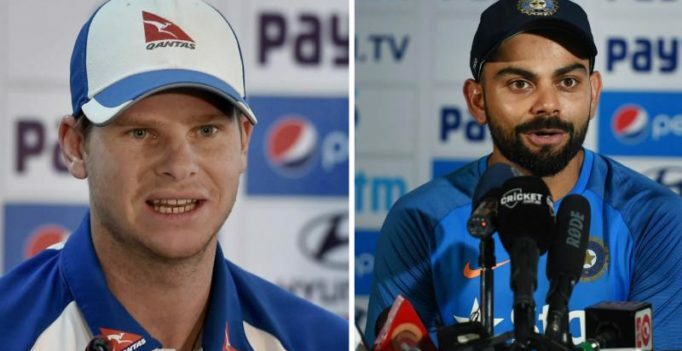 Ranchi: Allegations and denials flew thick and fast between rival captains Virat Kohli and Steven Smith with the India skipper claiming that the home team physio Patrick Farhart was “disrespected” by visiting players. Kohli alleged that some Australians unnecessarily taunted the Farhart but Smith denied the claim. “They (four-five of them) started taking Patrick’s name. I don’t know why. He’s our physio. His job is to treat me. I don’t find the reason behind it. I could not understand. You must ask why they have started taking his name,” said Kohli at post match press conference. Later Glenn Maxwell was seen mocking Kohli’s injury when he imitated his action by clutching his right shoulder after his dive to save a boundary. The Indian skipper, too, gave it back with a similar gesture when David Warner got out on Sunday. However, Smith insisted that they never disrespected Farhart, who himself is an Australian. “It was a bit disappointing. I didn’t actually do anything. Virat was having a go at me saying I was disrespecting Patrick Farhart. I was probably the exact opposite.